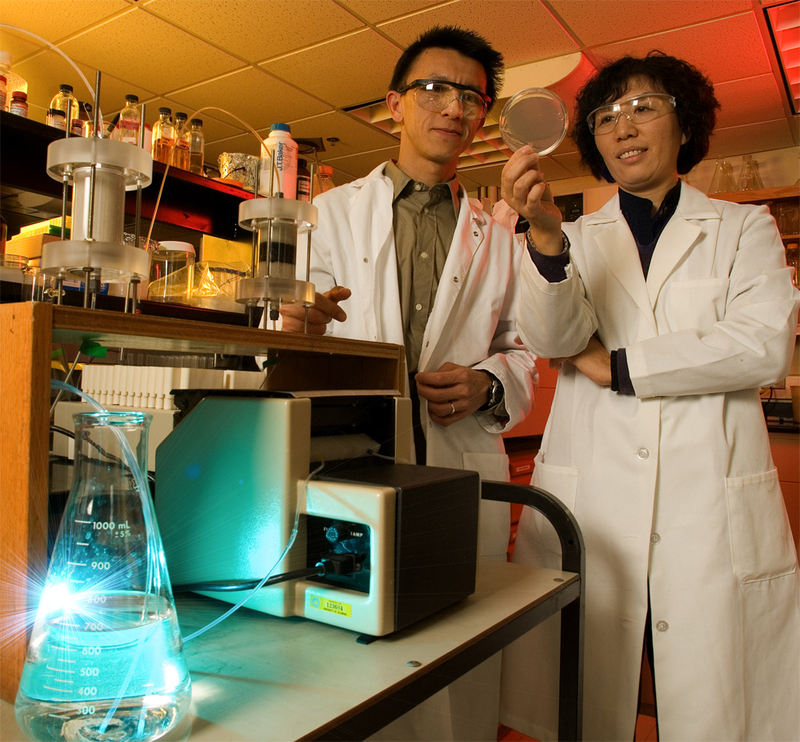 3:21 p.m., Feb. 26, 2007--University of Delaware researchers have developed an inexpensive, nonchlorine-based technology that can remove harmful microorganisms, including viruses, from drinking water. 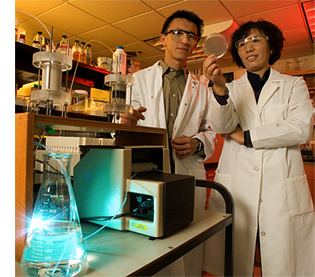 UD's patented technology, developed jointly by researchers in the College of Agriculture and Natural Resources and the College of Engineering, incorporates highly reactive iron in the filtering process to deliver a chemical “knock-out punch” to a host of notorious pathogens, from E. coli to rotavirus. The new technology could dramatically improve the safety of drinking water around the globe, particularly in developing countries. According to the World Health Organization (WHO), over a billion people--one-sixth of the world's population--lack access to safe water supplies. In the United States, viruses are the target pathogenic microorganisms in the new Ground Water Rule under the Environmental Protection Agency's Safe Drinking Water Act, which took effect on Jan. 8. “What is unique about our technology is its ability to remove viruses--the smallest of the pathogens--from water supplies,” Pei Chiu, an associate professor in UD's Department of Civil and Environmental Engineering, said. Of all the inhabitants of the microbial world, viruses are the smallest--as tiny as 10 nanometers. According to the American Society for Microbiology, if a virus could be enlarged to the size of a baseball, the average bacterium would be the size of the pitcher's mound, and a single cell in your body would be the size of a ballpark. Since joining UD in 1995, Jin's primary research area has been investigating the survival, attachment and transport behavior of viruses in soil and groundwater aquifers. One of the projects, which was sponsored by the American Water Works Association Research Foundation, involved testing virus transport potential in soils collected from different regions across the United States. Jin's group found that the soils high in iron and aluminum oxides removed viruses much more efficiently than those that didn't contain metal oxides. With partial support from the U.S. Department of Agriculture and the Delaware Water Resources Center, through its graduate fellowship program, the scientists and their students began evaluating the effectiveness of iron granules in removing viruses from water under continuous flow conditions and over extended periods. Two bacteriophages--viruses that infect bacteria--were used in the initial lab studies. 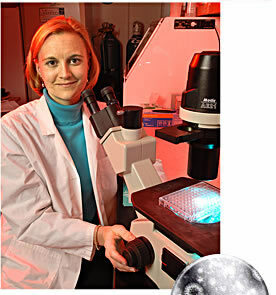 Kali Kniel, a virologist at UD, has provided critical expertise in documenting the UD technology's effectiveness in removing pathogens such as rotavirus, shown in the magnified view at right. Rotavirus is the number-one cause of diarrhea in children. Since then, Kniel has been documenting the technology's effectiveness against human pathogens including E. coli 0157:H7, hepatitis A, norovirus and rotavirus. Rotavirus is the number-one cause of diarrhea in children, according to Kniel. “Our hope is that the technology we've developed will help people in our country and around the world, especially in developing countries,” Jin noted.